Home » brewing sake » brewing (and chewing) the origins of sake. brewing (and chewing) the origins of sake. Squish, squish, squish….splat. The unflattering sound of chewing and spitting countless mouthfuls of brown rice is getting odd looks from my wife and daughter. There is no getting around the sound and no way of subtly sitting there chewing grain and spitting it into a 3000 ml pyrex beaker that wouldn’t get some weird looks. Sake, like many grain-based alcoholic beverages, has humble beginnings. Early humans didn’t understand yeast or microbiology, but one thing they did understand was that sweet things left out in a container would ferment into alcohol. This fact is even understood by some monkeys who store rotten fruit in the hollows of trees or depressions in rock; returning days later to eat the fermented fruit to make them feel good. Unlike fruit (which can ferment right off the vine) or barley (which can be converted to sugar by making primitive breads), rice needs some catalyst to convert the starches into sugars to ferment. Luckily the human body produces an enzyme called amylase in our saliva. If you take a mouthful of rice or potato and chew it, you will notice that the starches become thinner as you chew and it also gets progressively sweeter – this is the amylase slowly converting starches to sugar. This “technology” was used in other parts of the world as well, like Cauim in Brazil or Chicha in Central America – both fermented beverages made by chewing corn. The early Japanese people also understood this and used it to make simple alcohol. In the pre-rice days of the Jomon period, people chewed millet, buckwheat, acorns, chestnuts and other starchy foods to create a rough alcohol that was consumed for medicine and ceremonial uses. As rice growing technology was introduced from China near the close of the Jomon period, people naturally applied the same methods to producing alcohol from this new crop – thus Sake was born. This type of early Sake is known as “Kuchikami Sake” [ 口 kuchi – mouth, 噛む kamu – to chew]. a Pyrex container to hold the Sake and actual Sake yeast as opposed to wild yeast. The container was a convenient shape to not only ferment in but it had a wide mouth to allow for spitting the rice. Early Sake were fermented with wild yeast that floats around in the environment. 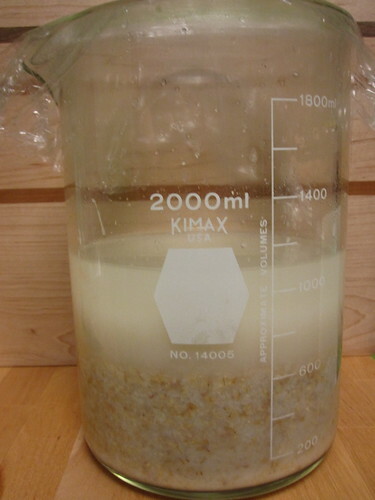 Wild yeast is still present today but with suburban development the concentration in the air is much lower; I needed a quick ferment to prevent other microorganisms from taking root in my Sake and spoiling it – thus the use of brewing yeast. The third was a stir plate so that I wouldn’t have to open the Sake to stir it. The enzymes are in the liquid and need to “digest” the rice; a stir plate would speed this process by keeping the mixture moving. 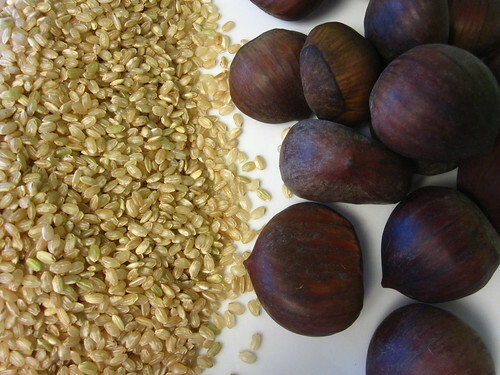 I decided that my fermentables would come from brown rice (early people had little or no milling technology) and chestnuts, as a nod to the earliest Sake produced in Japan. I simply cooked the rice in water like you would do for eating it; the chestnuts I roasted in the oven. After these were cooked, I simply sat down and started chewing. I tried to chew until I felt the material getting thinner and sweeter to ensure that the amylase enzymes were doing their work. Considering that this was a very small batch, it was much more work than I thought – a lot of chewing is tiring indeed! Every 3rd mouthful or so I would rinse my mouth with water and spit that in the beaker as well. When the chewing came to an end, I simply added as much water as I felt was necessary to approximate a normal Sake moromi (mash) – roughly 2 cups. I pitched the yeast and sat back to let my microbial friends do their thing. By the next morning there were the telltale bubbles of fermentation and you could smell the sweetness of rice. 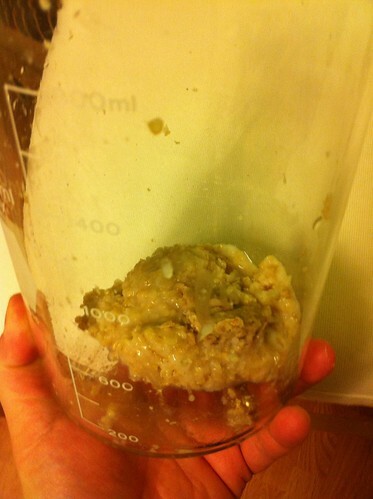 I simply left this experiment for 2 weeks to give it time to finish fermentation. After bubbles ceased I move it to the fridge to let the solids settle and the finished Sake to rise to the top. The resulting liquid was a fascinating look into the origins of modern Sake. The aroma is of sweet rice and earth with a pronounced acid twang. The color is cloudy white with very little of the yellowish tint in most Sake. The flavor?…. rice sweetness with a background of earthiness and nuttiness with a strong lactic acid bite. 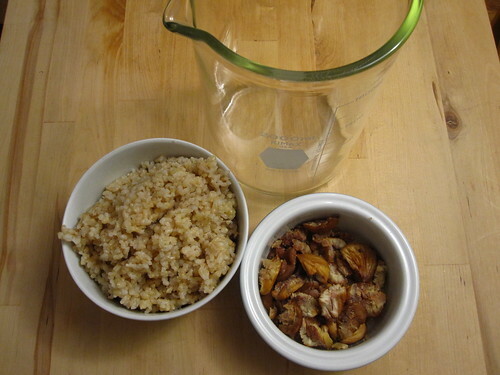 With the slower conversion of rice and nuts to sugar using saliva (VS. Koji), lactic acid bacteria flourished along with the Sake yeast. While this process is kept in careful balance in modern Sake, in this experiment it was unchecked giving me a strong acidity. The alcohol is also not as high as modern Sake, it seems some of the sugar are not fully converted leaving them unfermented; the ABV% is roughly 7%, not bad for such primitive methods. Even with these attributes it not unpleasant to drink although you will have to take my word for it – convincing others to drink Sake made from my saliva isn’t very easy! If it was easier, is it good enough that you would make it again? Or is it not really that good? Thanks for writing about your experience here. I wonder what it would be like if you made your own yeast. In macrobiotics they tell you to chew your brown rice thoroughly, and that it becomes sweeter as you chew it. I’ve been eating brown rice that way for many years, often enough without side dishes, and I know how it becomes sweet. 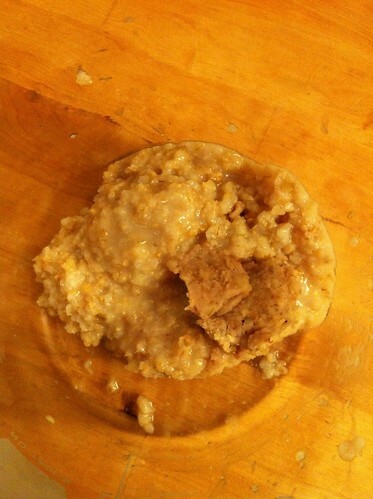 But also, I have a macrobiotic dessert recipe book somewhere that tells you how to convert the starch of cooked brown rice to sugar by adding mashed wheat sprouts and maintaining the mixture at a certain temperature (fairly hot as I recall). It worked well the couple of times I made it. I strained off the liquid and used it as a sweetener. But I wonder if you could take that sweet rice mixture and add yeast and turn it into some kind of brown rice sake … maybe I’ll give it a try. I’ll have to dig out that recipe book.